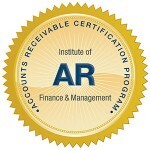 What is the IOFM Accounts Receivable Certification program? With over 25,000 certified financial operations professionals worldwide, IOFM’s rigorous certification programs set the global standard for excellence in the accounting professions. Earning your Accredited Receivables Specialist (ARS) or Accredited Receivables Manager (ARM) certification demonstrates your firm grasp of the fundamentals, a thorough understanding of best practices, and your commitment to accuracy and compliance, all of which are necessary to excel in the field of Accounts Receivable. The ARS and ARM designations are held by individuals and AR departments at leading Fortune 500 companies, non-profit organizations, colleges and universities, and institutions around the world who value accuracy, efficiency, clarity and transparency in the accounting function. Whether you are just starting your path in AR or are a well-established professional, the AR Certification program will serve you well as you advance in your career. Available entirely online and on-demand, the program includes a comprehensive study guide, a 6-hour training video, a practice exam, and a 90-minute, 100-question exam (each candidate has up to three attempts to pass). Certification is maintained by earning 15 Continuing Education Units (CEUs) annually, keeping you up-to-date with latest in AR regulations, best practices and technologies. Say hello to a brighter future in AR. Higher earning power. Our research indicates that certified AR professionals earn more than their non-certified peers. While your day-to-day performance says a lot about you as an individual, completing the training program and passing a rigorous exam proves that you have a firm grip on the core principles of the profession – and that’s a distinction that gets rewarded. Sharper skills. Certification builds skills – from the fundamentals to the advanced nuances of AR. To maintain your ARS or ARM certification, you’ll engage in continuing education for 15 hours each year, keeping you up-to-date on the newest developments in your field. More respect. Certification places you in an exclusive group of AR professionals whose skills are proven to meet a global standard of excellence. Receiving your AR certification increases your credibility and shows your peers, supervisors, and the public your commitment to your line of work. A stronger resume. Job searches are competitive, and it’s not easy to get your resume to the top of the pile. Certification demonstrates that you’ve gone above and beyond to develop your skills and that you meet a rigorous training standard.